TWO-TONING, 2016-STYLE by Jim Corbran, Automotive Columnist For years I’ve been harping about the demise of the two-toned paint job. Other than a few vehicles (the Mini and Ford Flex come immediately to mind with their contrasting roof colors) you just don’t see the dramatic color schemes of the Fifties and Sixties on today’s cars. Although it’s still not a true two-tone, Nissan last year introduced their Color Studio for the Juke sport crossover. It starts with any offered color, and gives you a choice of contrasting colors for a number of the exterior body parts: mirrors, door handles, wheel accents, headlight surrounds, lower door sills, spoiler, and front and rear bumper accents. A few interior parts (floor mat trim and air vent rings) also get the treatment. Depending on the colors chosen, it can be quite striking as you can see from the photo below of my built-online Solar Yellow Juke SL with contrasting Red Alert accents. Not just striking, but downright weird was the Red Alert Juke to which I added Electric Blue accents. Yikes! 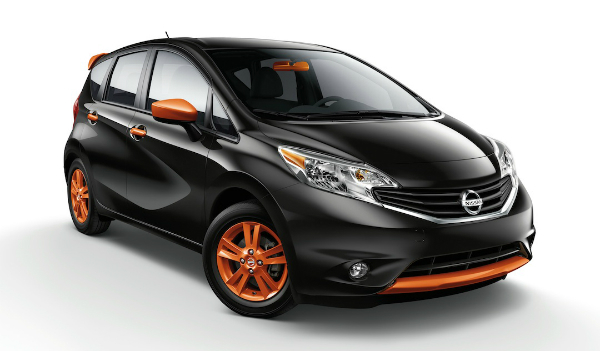 Starting this week (Tuesday, Nov. 17 to be exact) Nissan will begin offering the Color Studio option for its compact Versa Note. I’d love to see a real two-tone offered. But I won’t hold my breath. Build your own Juke here: Juke Color Studio, or begining 11/17, colorize a Versa Note. ### The post TWO-TONING, 2016-STYLE appeared first on Buffalo Cars.